Although the American Civil War took place over 150 years ago, there is STILL plenty to learn about the bloodiest war in U.S. history. One particularly under-discussed chapter involves the vast Trans-Mississippi West. Where exactly is that, you ask? The Trans-Mississippi West refers to all major military operations west of the Mississippi River but excluding the states and territories bordering the Pacific Ocean. The theater presented the Union with strategic terrain for projecting its military power. President Abraham Lincoln considered it a campaign to control arable (and gold-filled) land, pacify Western denizens, and eliminate a possible Confederate stronghold. He knew such a primitive frontier would be hard-won. Over the course of the war, his War Department marshalled some 200,000 Union soldiers to the hardscrabble landscapes of New Mexico, Missouri, Arkansas, Louisiana, and Texas. The book devotes several pages to the Red River expedition, a.k.a. the struggle for Louisiana and Texas, which took place in the spring of 1864. 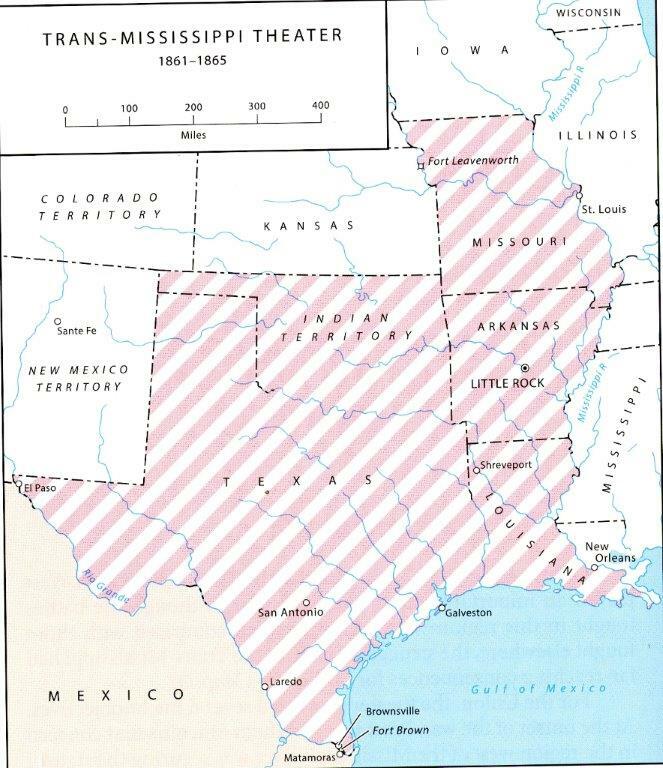 The Federal campaign through the Red River Valley intended to open up a Union path for a Texas invasion. But commanding officer Maj. Gen. Nathaniel P. Banks bungled almost every maneuver and eventually retreated his 30,000 troops in humiliation. Although the initiative did cause a “disruption of Confederate designs,” it didn’t do much to sway the war’s outcome. That Union debacle eventually gave way to Price’s Raid. Three gory, inconclusive years and Lincoln’s looming reelection sent Southern leaders into a panic. They believed that to save their cause, they would have to re-capture Missouri for the Confederacy. During the fall of 1864, Confederate cavalry raided Missouri and Kansas. Long story short, Union troops delivered a decisive blow. Price’s ineffectual raid effectively ended major combat operations in the Trans-Mississippi. Much of Civil War history remains focused on events east of the Mississippi. Ultimately, the Trans-Mississippi closedown was not a “winner, winner, chicken dinner” pivot for the Union. Perhaps it will remain a forgettable theatre in an unforgettable war. But the Trans-Mississippi did allow the North to prove itself a better organized, better led army. And that certainly was a leading factor in the Union’s overall victory. This entry was posted on Wednesday, June 22nd, 2016 at 1:14 pm and is filed under Center of Military History, Civil War, Military History, U.S. Army. You can follow any responses to this entry through the RSS 2.0 feed. You can leave a response, or trackback from your own site.